If you’ve been dreaming of playing your favorite PC games on the toilet without actually bringing your desktop into the bathroom with you, you’re in luck. Steam’s Link app for Android, which lets you stream titles to your phone over Wi-Fi, is now available in beta on Google Play – and I’m happy to report that it works as advertised. As long as your PC and phone are on the same Wi-Fi network, Steam Link will be able to beam games to your device. Naturally, the more powerful your hardware and connection are, the better your experience will be: Valve recommends connecting your PC to the web via an ethernet cable, and ensuring your phone is using your router’s 5GHz band if possible. 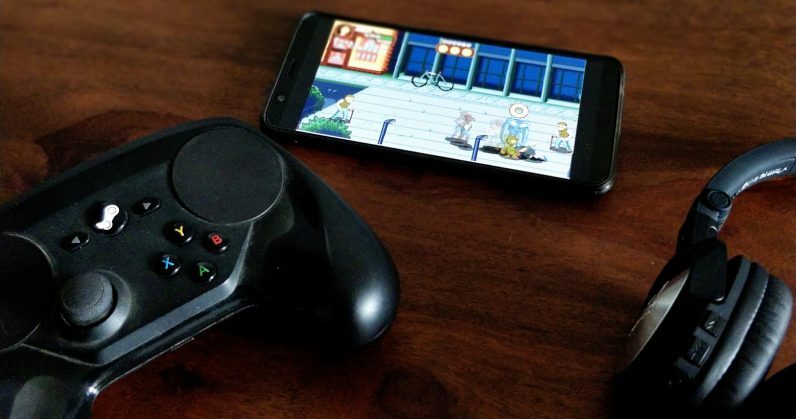 You’ll also want to use a Bluetooth controller for the most part: touch input is recognized, but it’s not ideal, and most games don’t support it for actual gameplay (even if it works in menus and such). To that end, the Steam Controller works pretty well, once you’ve updated its firmware by plugging it into your PC with a microUSB cable and selecting the option in Steam’s settings. Valve told Variety that its app is capable of streaming games at 4K resolution and 60 fps, if your gaming rig, mobile device, and router are up to the task. After I followed all the setup instructions in the Steam Link app on my phone, I was good to go. My work laptop isn’t great with high-end graphics, so I opted to try a couple of titles that would run smoothly with its configuration: Coffee Crisis, a retro 8-bit style brawler, and Ruiner, a cyberpunk top-down shooter. Both games ran just as smoothly as they do on my computer, and I didn’t notice any drops in framerate, or input lag when using the controller – even though Steam Link said my phone model hadn’t been tested for compatibility, my connection wasn’t ideal, and one of the titles wasn’t designed for controller input. However, I couldn’t figure out a way to play games that required a mouse and keyboard, like Age of Empires II: HD Edition. The controller’s trackpads didn’t allow me to move the cursor around, and none of the buttons served as left- or right-click either. Still, Steam Link is handy for all the times you’ve wanted to clock some game time, but didn’t want to sit in front of your PC. I imagine it’ll probably allow for a better experience on a tablet with a larger screen than a phone. I also wonder if game developers can bake in touch support for strategy games and RPGs so they’re easier to play without a controller – it’d be a blast to command armies of Incas to slay the invading Conquistadors while lying in bed. To give it a go yourself, grab the Steam Link app for your Android device from Google Play to get started. An iOS version will soon become available, and work with devices running iOS 10 and newer, as well as Apple TVs running tvOS 10.3 and up.